John Williamson was the son of Alexander and Anne Williamson. He was born in County Tyrone about 1888. The family lived near Tempo, County Fermanagh. His father was an agricultural labourer. 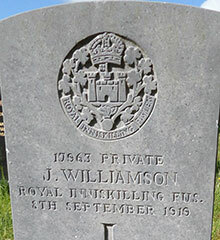 Private John Williamson was serving with the Royal Inniskilling Fusiliers when he died on 8th September 1919. He was 31 years old. John Williamson is buried in Fivemiletown Church of Ireland Cemetery. The CWGC also records John as the husband of Caroline Williamson of Edenamore Terrace, Tempo.